Constructed in 1964 to meet the needs of Wayne State's growing Business School, the Prentis Building was designed with the Helen L. DeRoy Auditorium to form a two-building complex on the Wayne State University campus.The two buildings were designed to relate closely to one another both in terms of their functions and in architectural and spatial terms. Completed in 1964, the Prentis Building is a three story steel-frame structure that is rectangular in shape and has a flat roof. It is designed in the International Style, set on supports of thin columns holding up the two upper stories. 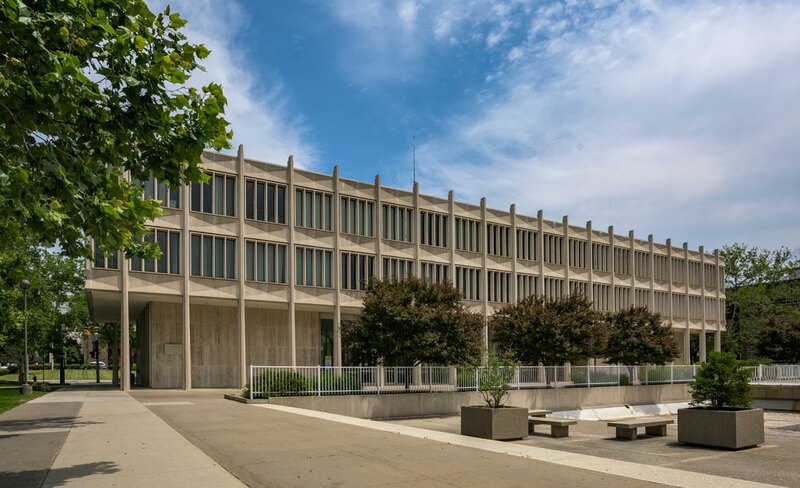 The Prentis Building is faced with buff-colored travertine marble on the first story, and cast concrete panels on the second and third stories. The cast concrete panels allow for deeply inset narrow windows similar to those used by the architect, Minoru Yamasaki, on the Department of Education Building nearby on the campus. The columns supporting the structure are clad in cast concrete flecked with white marble chips. Each terminates in a finial with projecting central and slightly lower recessed side sections. The $2.3 million construction cost for the new building was supported through the philanthropy of Meyer L. and Anna Prentis and currently houses the School of Business Administration. For detailed information regarding the Prentis building on the National Register of Historic Places, please click here.